When we talk about Azure architectures for data warehousing or analytics, we usually show a diagram that looks like the below. This diagram is a great start to explain what services will be used in Azure to build out a solution or platform. But many times, we add the specific resource names and stop there. If you have built several projects in Azure, you will know there some other things for which you will need to plan. So what’s missing? For instance, users who will participate in Data Factory pipeline development must be assigned to the Data Factory Contributor role in Azure. Users can authenticate via AAD to log in to Azure SQL DW. 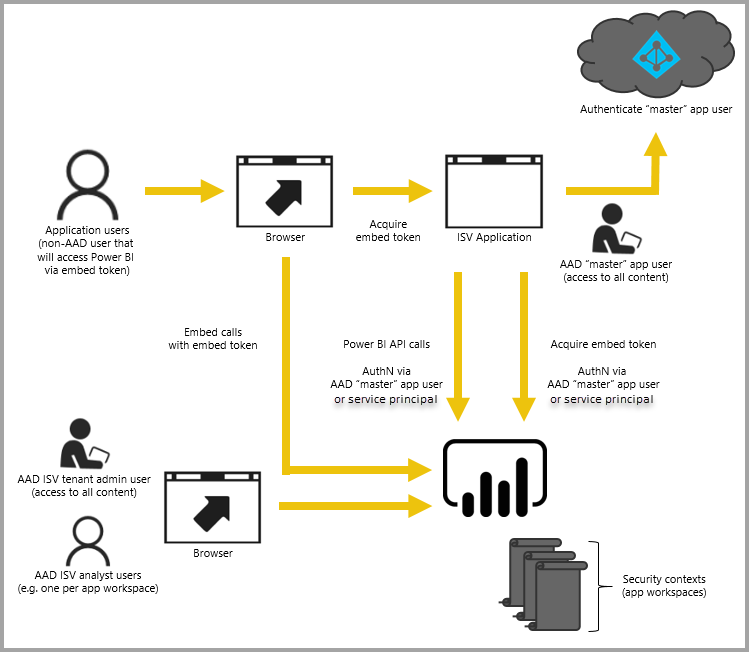 You can use AD Groups to grant permissions to users interacting with various Azure resources such as Azure SQL DW or SQL DB as well as Azure Analysis Services and Power BI. It’s more efficient to manage permissions for groups than to do it for each user. You’ll need a plan to manage group membership. You may also need to register applications in Azure Active Directory to allow Azure services to authenticate and interact with each other. While the guidance for many services is now to use managed identities, this may not be available for every situation just yet. If your organization has some infrastructure on premises, it is likely that they have Active Directory on premises as well. So you will want to make sure you have a solution in place to sync your on-premises and Azure Active Directory. Virtual Networks (or VNets) allow many types of Azure resources to securely communicate with each other, the internet, and on-premises networks. You can have multiple virtual networks in an Azure subscription. Each virtual network is isolated from other VNets, unless you set up VNet peering. Some PaaS services such as Azure Storage Accounts, Azure SQL DW, and Azure Analysis Services support Virtual Network Service Endpoints. A common usage scenario is to set up VNets and VNet Service Endpoints to connect resources to on-premises networks. Some organizations prefer to use VNet Service Endpoints instead of public service endpoints, making it so that traffic can only access the resource from within the organization’s local network. In order to connect a VNet to an on-premises network or another VNet (outside of peering), you’ll need a VPN Gateway. You’ll need to identify the most appropriate type of VPN Gateway: Point-to-Site, Site-to-Site, or Express Route. These offerings differ based on bandwidth, protocols supported, routing, connection resiliency, and SLAs. Pricing can vary greatly based upon your gateway type. While VNets and VPN Gateways are probably the most common networking resources in Azure, there are many other networking services and related design decisions to consider as you plan an Azure deployment. Your BI solution may be entirely in Azure, but if you need to retrieve data from data sources in a private network (on premises or on a VNet), you’ll need a gateway. If you are using Azure Data Factory, you’ll need a Self-hosted Integration Runtime (IR). If the source for your Power BI or Azure Analysis Services model is on a private network, you’ll need an On-Premises Data Gateway. You can use the same gateway to connect to Analysis Services, Power BI, Logic Apps, Power Apps, and Flow. If you will have a mix of Analysis Services and Power BI models sharing the same gateway, you’ll need to make sure that your Power BI region and your AAS region match. These gateways require that you have a machine inside the private network on which to install them. And if you want to scale out or have failover capabilities, you may need multiple gateways and multiple VMs. So while you may be building a solution in Azure, you might end up with a few on-premises VMs to be able to securely move source data. Our nice and tidy diagram above is only showing production. We also need at least a development environment and maybe one or more test environments. You’ll need to decide how to design your dev/test environments. You may want duplicate resources in a separate resource group; e.g. a dev resource group that contains a dev Data Factory, a dev Azure SQL DW, a dev Azure Analysis Services, etc. While separating environments by resource group is common, it’s not your only option. You will need to decide if you prefer to separate environments by resource group, subscription, directory, or some combination of the three. ARM templates and PowerShell are very useful for deploying updates and creating new environments. Also, take a look at Azure Blueprints. You’ll also want to investigate ways to keep the costs of non-prod environments down via smaller-sized resources or pausing or deleting resources where applicable. There are several other ancillary Azure services that could/should be part of your solution. For source control, GitHub and Azure Repos have the easiest integration, especially with Azure Data Factory. You’ll not only want source control for things like database projects and Data Factory pipelines, but also possibly for ARM templates and PowerShell scripts used to deploy resources (think: infrastructure as code). You’ll want to set up Azure Monitoring, including alerts to let you know when processes and services are not running as intended. If you want more cost management support than just setting a spending limit on a subscription (if it is available for your subscription type), it may be helpful to set budgets in Azure so you can be notified when you hit certain percentages or amounts. Be sure to think through the entire data/solution management lifecycle. You may want to include extra services for cataloging, governing, and archiving your data. This may sound like a complex list, but these resources and services are fairly easy to work with. Azure Active Directory has a user-friendly GUI in the portal, and commands can be automated with PowerShell, requiring relatively little effort to manage users and groups to support your BI environment. VNets and VPN Gateways are a little more complex, but there are step-by-step instructions available for many tasks in the Microsoft Docs. The Power BI Gateway and ADF IR have quick and easy GUI installers that just take a few minutes. You can automate Azure deployments with Azure Pipelines or PowerShell scripts. None of these things are really that awful to implement or manage in Azure, unless you weren’t aware of them and your project is paused until you can get them set up. Is there anything else you find is commonly left out when planning for BI solutions in Azure? Leave me a comment if you would like to add to the list. Make sure you have a plan for how to process your Azure Analysis Services model. Will you use Azure Automation? Call an Azure Function from Data Factory? Be sure to organize and tag your resources appropriately to help you understand and control costs. Don’t forget Azure Key Vault. This will help you keep keys and passwords secure. While there is pretty good documentation for this, the steps weren’t immediately clear to me because the app owns data and user owns data scenarios are mixed and matched in some parts of the documentation from Microsoft. I found there are 8 main steps to embedding content with row-level security enabled in an app owns data scenario. Create the Azure Active Directory account to be used by the embedding application. Assign a Power BI Pro license to the account. Create an app workspace in PowerBI.com. Set the workspace to private. Set the analyst who owns the report as the workspace admin. Set the service account (created in step 1) as a workspace admin. Update the Power BI report with row-level security roles and filters. Ensure that usernames and corresponding roles are available to the application. Publish the Power BI report to the app workspace. Register the application that will show the report in Azure Active Directory. Add code to the application to get the Active Directory access token. Provision the appropriate Power BI embedded capacity in Azure and assign the app workspace containing the report to the embedded capacity. There is an example project in Github for your reference, as well as a utility to help you generate your embedding code. Interestingly, row-level security works just the same as it does on PowerBI.com. You do nothing different in your PBIX file. You just don’t populate the role members in PowerBI.com. Instead, your pass the effective user in your embed token. Unlike using the Publish To Web feature, Full Screen mode is not available in an embedded report. You can, however, add a button on the page where you embedded the report that allows it to go full screen. As of March, you can hide visual headers on all visuals in a report in Reading View. This looks much cleaner and alleviates the issues that arise when menus at the top of one visual overlap the bottom of another. But this also means that users won’t be able to access menu options such as In-Focus Mode and Export Data. If these are important, you will want to leave your visual headers visible. If you have some pages where you would like users to export data and others where it isn’t important, consider splitting out the report so you can turn the visual headers on for one report and off for the other. After making changes and testing your report, make sure to clear any slicer values before publishing, if you have row-level security on a field shown in a slicer and you leave values selected. The selected values will be shown to users when they view the report. For example, let’s say you have created a row-level security role that can only see Product A, but you can see everything, and you left Product A and Product B selected and deployed the report. A user who views the report next and is a member of that RLS role will see the two selected values in the slicer, even though they can’t see the data for Product B on the page. This may not be a big deal for an internal report. But now imagine this is for clients. You don’t want clients to see other clients in the list. This behavior is consistent in the Power BI web service and isn’t specific to embedding. It’s just important to remember this. By default, a report will load the page that was shown when the user last saved it. This happens in PowerBI.com as well. In embedded solutions, the page of a report can be specified in the embedding code, essentially specifying a default page within the report when viewed through the application. If a user hits the refresh button on their browser while looking at the report, the report will be loaded to the default page rather than the page the user was last viewing. My POC proved out that Power BI provided the functionality to add great visuals to an application page that a non-developer analyst could manage. It also helped us understand our formatting options. You can get started with Power BI embedded without having to provision the embedded node in Azure, so it’s a no/low dollar commitment to give it a try. If you have done a Power BI embedded project, please comment and let me know what you liked and didn’t like, or if there are any ideas to which I should add a vote.